Yesterday the Senate immigration reform bill passed 68 to 32, picking up all Democrats and 14 Republicans. Now it will move to the house where it will be largely ignored while the Republicans slowly come up with their own piece meal version, if they come up with anything at all. 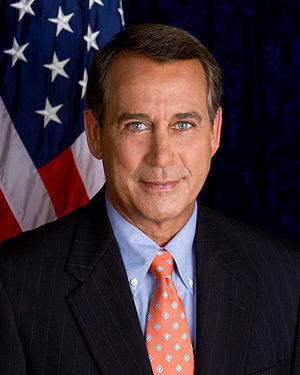 In my previous post I suggested a long shot scenario in which Speaker John Boehner would bring the Senate bill up for a vote in the House, but I’m upping my odds to 40-to-1 as he holds steadfast to the notion he won’t bring up a bill that lacks the support of over 50% of his caucus, which the Senate bill will never get. Sooooo…..like soooo many other things in congress, the bill will dilly dally until who knows when, perhaps for months as Congress adjourns in August and then in September they will be back to battling issues of a budget extension and raising the debt ceiling. The ongoing tug-of-war that gets us nowhere when it comes to our fiscal problems. Perhaps the most interesting thing about immigration reform is the split between those 14 Republican Senators and the Republican majority in the House, one of many indications of a fractured party. Those 14 reflect the belief that the Republicans cannot win a national election without shifting the balance of Hispanic votes away from the 70% level that voted for Obama. Those Republicans who oppose immigration reform are largely a combination of those whose careers are insured by Gerrymandered districts as long as they don’t look at all liberal, and/or out of the belief that enabling more illegal residents to become citizens will likely produce even more voters for Democrats. It is one of several splits within the Republican Party that make it difficult for them to come up with a coherent message at the national level and produces a tightrope for Republican presidential candidates to walk, pressured to be more main stream in terms of the general election, but sufficiently conservative in the primaries to receive the nomination. A topic we will return to at a later time. Immigration Reform: How’s It Going? At this point, the immigration bill appears likely to be passed in the Senate soon and then go to the House. The bill, like most, is complex and I don’t pretend to understand its ins and outs, though I do know more about it than I will get into today and my sense is it would create a much better “system” than we have now. Which wouldn’t be all that hard when you think about it. But why bother getting into the pros and cons of the bill when the House Republican majority seems in such disarray that it is hard to imagine anything constructive happening in that chamber? If you haven’t heard, Speaker Boehner could not deliver enough Republican votes to pass the relatively uncontroversial farm bill yesterday after indicating that he did have the votes, which reflects the chaos that is the House. Of course, Boehner blamed the failure on the Democrats for not supplying enough votes themselves, but….. the point is a deal seemed to have been reached and then suddenly wasn’t. If you recall, the Speaker has thought he has had the votes on at least one other measure in the past that wound up failing, which suggests a degree of underlying chaos in his caucus. Well, there is NO CHANCE that a majority of Republicans will support a bill, so unless he changes his mind about that, there is little left to say about immigration reform other than it will soon become a dead issue for the time being. Now, could Boehner change his mind and let the bill go to the floor of the House and allow it to be passed largely by Democrats but with enough Republicans to make it through? Well, I think there is a long shot chance he could? Why? Because the mishandling of the farm bill was one more embarrassment for the Speaker and he is a proud man who just might be willing to risk losing his Speakership to a Tea Party rebellion if able to get something noteworthy accomplished in the House that figures to benefit his party in the next presidential election. It would probably be political suicide, but there are worse ways to go and it would be taking a bullet, so to speak, for the Republican Party at large as opposed to its right wing factions. Simply put, if the Republicans are to regain the White House in the foreseeable future they will need more than the 30% of Latinos who voted for Romney in the last election. And this immigration bill would help in that regard. I admit that is just my fantasy, but as a horse player who has won on the occasional longshot, I’d bet two bucks with anyone that he does just that, though you will have to give me 20-to-1 odds. Edward Snowden: Hero, Traitor or What? Just when I thought national politics would nearly bore me to death this summer, what with Congress having gotten so good at accomplishing so little, up jumps a fascinating story in the form of Edward Snowden. Certainly by now you know the gist, a 29 year old government out-sourced computer systems administrator has released numerous top secret documents to the press and is now making a home in Hong Kong, hoping the Hong Kongites will protect him from the long arm of American law. There are several elements that interest me about the Snowden affair, but unlike so many others, I’m not interested in making a snap judgement on the man. Hero, traitor? What’s the rush? Why not let the story play out for awhile, let more facts come out and get more clarification? What’s most interesting to me about this is you can’t jump to the usual conclusions as to who is on which side of the debate. It is truly one of those “you can’t tell the players without a program” moments. For example, how often do you find Michael Moore and Glen Beck on the same side of an issue? Like never? But both see Snowden as a hero. Ron and Rand Paul are also on the Hero Team. This is one of those odds moments when the spectrum of left to right curves into a circle leaving extremes on both sides holding hands. Both have a deep distrust of government. Among those on the Traitor Team are, of course, members of the government, such as the head of the NSA, but also frequent Republican critics of the administration, like Senators John McCain and Lindsey Graham. Add to that group Diane Feinstein (D.) and Mike Rogers (R.), the chairs of the Senate and House Intelligence Committees respectively. It is the trade off of security vs. privacy that divides the two teams, with the Hero Team imagining the administration committing worse crimes through government technological over reach than Edward Snowden has in divulging “state secrets”. The Traitor Team, on the other hand, believe there are sufficient checks and balances on government spying on Americans in place. They believe this because they see themselves as part of those checks and balances, or at least know more about them than we, the public, does. I imagine some of you are on the Hero Team and others on the Traitor Team. I am more interested in whether his actions did more good or bad for our country. I tend to think what Snowden did was more good as it opens the possibility of a real debate over security vs. privacy, which the President has said he wants but we wouldn’t have had without Snowden or the like revealing some government secrets. On Thursday FBI Director Robert Mueller told Congress: “…these disclosures have caused significant harm to our nation and our safety.” O. K., but haven’t they also done some good for our democracy? The judgement as to whether to call Snowden a hero or a traitor does not exclude the possibility that he did more good than bad when releasing that information. Liberal leaning Columnist Matt Miller has said Snowden is “no hero,” that he is basically a law-breaker with a “grandiose” sense of himself. Others well versed in national security assert that the young man is exaggerating what he knew or could know in his position. So what if he is on a giant ego trip. You don’t have to be a great man or woman to do a good thing. P. S. – I don’t know who is holding that sign in the photo above, but he may be a high school classmate of mine who has a rebellious nature, normally lives in Kansas and is known to wear strange disguises on occasion. We’ll call him MB, whose hair in normally gray, but the brown beard and hair could easily be faked. (Note to Blog Followers: I suggest you click the Gravitar at the upper left of your email to go to my web site so as to easily link to the Blogrollers I mention below). I devoted my previous post to introducing Paul Krugman’s blog because there was a lot to introduce. He is a relentless one man campaign for the importance of more government stimulus now, both here and in other countries, to get the world economy growing faster (or as with several countries in Europe, for example, growing at all). Over the past year I have kept an eye out for a conservative blogger to match Krugman in both economic stature and frequent postings, but the best I could come up with is Greg Mankiw. Nothing wrong with him as an economist. He’s got the chops there, but he is not an obsessive political advocate like Krugman. He seems moderately conservative and his blog is that of a genteel professor, not a crusader. He is a friend and colleague of Rogoff and Reinhart at Harvard, so a number of his recent posts defend them in the debate over their study. Also, if you google Krugman and Mankiw together you will find several articles about their disagreements. To provide reinforcements for Mankiw I provide a link to the American Enterprise Institute blog (AEI), which is generally considered the best of the conservative think tanks, meaning that while having a conservative (often neo-con) point of view, they have high research standards and, according to Wikipedia, take “no institutional positions on policy issues”. As also noted in Wikipedia, they are looked upon as the right leaning counterpart to the left leaning Brookings Institute, which is arguably the most respected U. S. think tank (though, of course, not if you are on the far right). AEI has a Money & Politicscolumnist-blogger James Pethokoukis who often challenges Krugman’s economic arguments as you can see if you google their names together. However, unlike with Mankiw, I can find no responses from Krugman to Pethokoukis. He doesn’t mention the man and here is my theory why. Krugman doesn’t respect him enough to respond. Pethokoukis has made a career of being a political and economic columnist, but his formal education came in the liberal arts and journalism, not economics. He does provide a frequent counter point to Krugman, though. David Frum is another conservative voice, though a moderate conservative who believes the Republican Party is badly in need of reform, which to those on the far right makes him a RINO. Well, I just noticed Frum is taking a break from blogging, but I imagine his posts will stay up for awhile, so you can still get a taste of his thoughts. In time I will replace him with another right-leaning blogger. I used to label Wonkblog as Ezra Klein because he wrote most often, but these days there are many contributors. While liberal leaning the quality of analysis is good and the posts come often so it provides regularly solid information about the poli-econ scene. The blog has several posts today related to today’s jobs report for those interested. Finally, there is Nate Silver’s 538 Blog which I referred to often in the last election as he had Obama as a big favorite for months, while most of the media was playing up the race as a close contest. My guess is Silver has liberal leanings, but being more a researcher than an advocate, he is not busy promoting a cause but in developing data from which to make accurate predictions. He often includes analyses on sports outcomes as well as politics. So, those are my Blogrollers, at least for now. I don’t expect to see a lot happening in Congress this summer other than investigations, mostly by Republican led committees, and party charges and counter charges and gridlock and more gridlock, all mostly political theater. Little of the serious business of the nation will get done, so I will likely post once a week instead of the usual twice and save us all some frustration. Meanwhile some of you might wish to pay more attention to my Blogroll (to the left), so let me say a little about that. I chose the six blog sites with the idea of providing a balance of liberal and conservative views on politics and economics. Today I will concentrate on economist Paul Krugman, who gets star billing because he is brilliant and a powerful liberal voice through his blog, his column in the New York Times, his numerous layman-friendly books, and his frequent appearances on TV political talk shows. While there are highly respective right leaning economists as well, they are not as ubiquitous in making their points known. Also, unlike Krugman, they don’t tend to suggest those with whom they disagree are either idiots or villains. Of course, many on the far right easily match or exceed Krugman in that regard, but their credentials in economics are about as weak as mine. They are ideologues not economists. In contrast, the most respected right-leaning economists are usually academics who shy away from politics, are accustomed to more genial disagreements and not as quick to accuse as Krugman. Rightly or wrongly, he blames them for bolstering the far right and he thinks his disagreements with them are often too important to play nice. 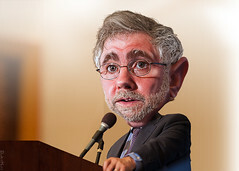 A good example of Krugman in action is the fairly recent controversy over an older, influential economic study by Harvard economists Ken Rogoff and Carmen Reinhart. The study has given support to those who believe in the need for government austerity (cutting spending to reduce debt) as a cure to our overall economic problems. However, a recent review of that study has revealed an important statistical error as well as some questionable assumptions which undermine the support it has given to those who stress the need for government austerity immediately. Since Krugman has led the charge for more government stimulus (spending incurring more debt) as our immediate response to a still weak economy (and putting off tackling the debt problem until it is stronger), he has had much to say about that Harvard study and its weaknesses. This split in economic theory is important because it underlies the political polarization in which the left wants more government money applied to expanding our economy and reducing joblessness, while the right wants to reduce government spending, claiming this spending doesn’t really solve our economic problems but just deepens and defers them to later generations. That this urgency about national debt was not often stressed by the right during the G. W. Bush years is another story. I’m not trying argue those points here, but merely noting that Krugman argues his position regularly with his blog and other forms of communication. And at times he has as many as five posts a day with links to friends and foes alike. Whether you agree with Krugman or not, reading his posts is an ongoing education in economics. To get a better sense of Krugman’s thinking and his way of expressing himself, I suggest clicking the Krugman blog link and scrolling down to one of his June 2 posts titled: The Spat. There he defends himself from what Ken Rogoff has called “very personal” attacks, even noting that Rogoff “is a magnificent economist”…. just not in this instance. While liberal to the core, he seems to be dealing with facts more than ideology most of the time. Of course, many would disagree, so I provide some balance to Krugman’s crusading ways with three sites on my Blogroll from conservative perspectives. You can figure out which three those are if you investigate all of the six linked blogs, or you can wait for me to return to the topic this Friday. Just exploring Krugman’s prolific postings seems plenty for now.